Present plans call for mass production of SelectaVision players in 1972 with a target price of under $400. A library of 100 half-hour tapes, mainly sports events and popular entertainment features, will be available at $10 per tape. The tapes are not made directly from life, but from movie films, video tapes, slides, or photographs. A color program originating from a color TV camera or color video tape player is recorded on movie film by means of an electron beam recorder. This film is then developed and converted by a laser to a series of holograms (optical interference patterns) which are recorded on a plastic tape coated with Photoresist, a material that hardens to varying degrees depending on the intensity of the light striking it. Next: the tape is developed in a chemical solution that eats away the portions of Photoresist not hardened by the laser. The result is a relief map whose hills and valleys represent the original image in coded form. Called the hologram master, this tape is coated with nickel and stripped away, leaving a nickel tape with the holograms impressed on it like engravings. This nickel master is fed through a set of pressure rollers with vinyl tape of similar dimensions to print the final tapes. 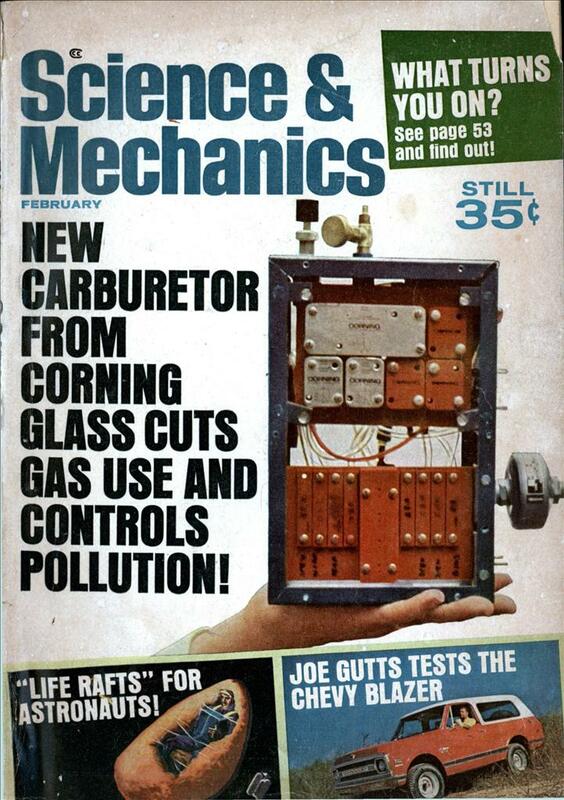 The Selectavision did come out, but was nothing like what the magazine article describes. The actual RCA Selectavision is described very well in the Wikipedia article. It was essentially a PVC (vinyl) disc like a record and the still frames of video were read with a needle. I have seen several of the players at thrift stores in my area. There were many systems named Selectravistion. I think they even named a line of VHS recorders that way. It strikes me as a bit Rube Goldberg like with the hologram played by a laser and the resulting image picked up by an internal TV camera. 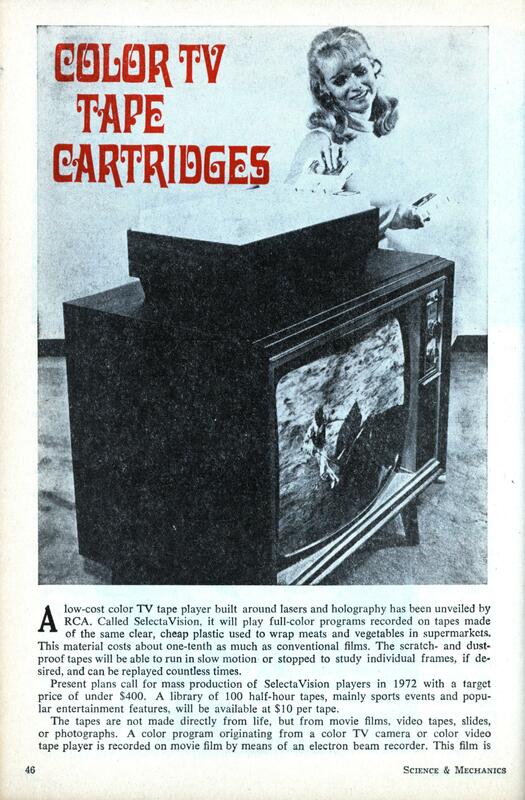 Considering what a laser and “low-cost” color TV camera cost in 1970, the players would have been very expensive.